I was hoping to catch up with the Webmaker teachtheweb mooc and get some DS106ing done this weekend, but I got carried away hoisting a jolly rodger. Almost two years ago I had a go at getting a PirateBox going. 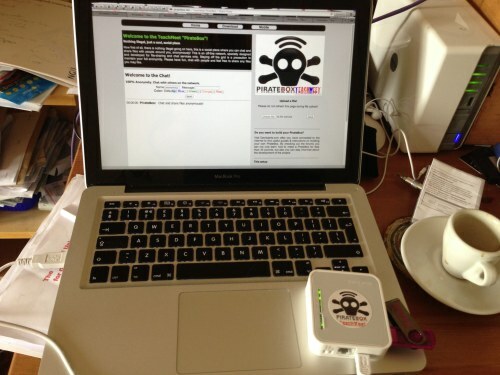 A PirateBox is a self-contained mobile communication and file sharing device. Simply turn it on to transform any space into a free and open communications and file sharing network. The PirateBox solves a technical/social problem by providing people in the same physical space with an easy way to anonymously communicate and exchange files. This obviously has larger cultural and political implications thus the PirateBox also serves as an artistic provocation. As I wrote then Obviously TeachMeets do not need the subversion of tracking and preservation of user privacy that a PirateBox offers. Nor would sharing of copyrighted material be desirable, but It might be fun to have a PirateBox at TeachMeets.from: A PirateBox for TeachMeet? would allow folk to share files with others at the meet. If it was a traveling project, the box could go from TeachMeet to TeachMeet spreading files as it went. This would provide a sponsor-less goodie bag. Folk would be free to share what they liked, perhaps presenters would share presentations, digital musicians give away background music etc. Obviously lots of the TeachMeet crowd already share many things online, A TM PirateBox would be a fun side project that might add to the buzz during a TeachMeet and be a concrete way of connecting different events. I ask for donations of a fiver on twitter and several folk stepped up. I then started trying and repeatedly failing to sort out the router I bought. It turned out to be the wrong model (not apparent on the box) and it left me with a bricked ruler and a little guilt. As I was shopping for some hard drives on Amazon I added a TP-Link TL-MR3020 Router to my basket. Yesterday I went through the instructions and they worked. Apart from one wee problem when I made a mistake in setting an ip address (exactly the same problem @cogdog had, so I am in good company). Today I set out to customise the interface a little, I used some of the files from Nargren/PirateBox · GitHub and manage to do some. I found this quite an unusual way for me to work, using the ssh command in the terminal and the vi editor. After a few gulps I managed to start work on the interface. I am hoping that someone might try the box out at TeachMeet TMTablet the week after next…. Neil Winton, Caroline Breyley, Olivia Wexelstein, jen Deyenberg, David Muir, Ian Hallahan, Katie Barrowman, Doug Belshaw, Drew Buddie, Drew Burrett and David Noble. 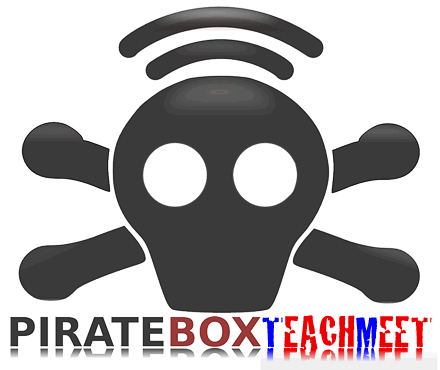 A while ago I proposed A PirateBox for TeachMeet?. Several kind folk donated a fiver and I ordered the Buffalo WZR-HP-G300NH wireless router from an amazon reseller. First problem was that I did not notice that it was shipping from the USA, it arrive the day before TeachMeet SLF11. I didn’t arrive home until late in the evening, but rolled up by sleeves to sort it out. Problem 2 was a USA power supply. This I rectified at Lunchtime the next day and settled down in a corner of the SECC to sort out the box. Apart from the fact I had plugged the mac into the WAN port rather than the LAN port(or the other way round) I didn’t have a wired connection to the network. A major fail, I realised the port problem the next day after TeachMeet and though ti would now be plain sailing. Yesterday evening I followed the instructions on PirateBox DIY OpenWrt – David Darts Wiki which went, I though pretty well. Unfortunately I didn’t really have a Buffalo WZR-HP-G300NH wireless router, I had a Buffalo WZR-HP-G300NH2 wireless router! The router was bricked. I decided to unbrick the router using instructions I found: WZR-HP-G300NH Router: Firmware flash and brick recovery through TFTP After a few tries I noticed extra OS X help in a comment, but still failed. I decided to leave it until today. I decided to try using linux running on my macbook under virtualbox. The mac had at least given me an “Unsuport MODEL” error after using tftp to flash the firmware, but the virtualbox linux idea got me nowhere. DD-WRT Forum :: View topic – problems recoberying buffalo wzrhpg300nhv2 which I am leaving until tomorrow. Based on hope rather than experience I would like t oget the box up and running at teachmeet strathclyde edition. 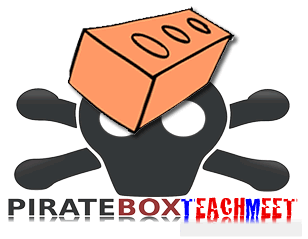 I am wondering if folk would donate a few quid for a TeachMeet PirateBox? I’d noticed Alan Levine blogging about StoryBox and even donated a file in after this post: StoryBox Wants YOU – CogDogBlog. More recently I saw it on Doug Belshaw’s Synechism Ltd. – User Outcomes Weekly – #11 (A weekly must read), where I commented wonder if a piratebox of some sort would be a useful addition to TeachMeets and the like? Doug had also linked to the PirateBox site where I read more about it and followed some links. Obviously TeachMeets do not need the subversion of tracking and preservation of user privacy that a PirateBox offers. Nor would sharing of copyrighted material be desirable, but It might be fun to have a PirateBox at TeachMeets. It would allow folk to share files with others at the meet. If it was a traveling project, the box could go from TeachMeet to TeachMeet spreading files as it went. This would provide a sponsor-less goodie bag. Folk would be free to share what they liked, perhaps presenters would share presentations, digital musicians give away background music etc. Having looked at the PirateBox DIY it looks like the cheapest way to make one is to use a Buffalo WZR-HP-G300NH wireless router which costs about £70. There are a few other bits and pieces needed but the cost is negligible. I’d like to put one together, take it to TeachMeet SLF11 and then post it off to another TeachMeet. Unfortunately I don’t have £70 Is there enough folk interested in putting in a fiver to make a box and set it adrift? If you are interested then DM tweet @johnjohnston, leave a comment here or make contact in another way, if I get a dozen people up for it I’ll send then a link to paypal me a fiver. As a PirateBox utilizes Free, Libre and Open Source software (FLOSS) I don’t think this is one for commercial sponsorship. If you do contribute you will get a warm fuzzy feeling and your name on the PirateBox.